“One of the most recognisable brands in the hospitality world, this fun and unique brand is set to change the landscape of Dubai. And you could say it already has, literally, with the bold neon light show glowing like a beacon right by the side of the new Sheikh Zayed Road flyover by Business Bay. For the ones who are unaware – W Hotels are the rebellious little brother of the hotel scene. The brand is barely 20 years old but is already as powerful as the old-school elites such as Hilton, Marriott and Four Seasons. With an eye towards a younger crowd, its properties break the mold with eye-catching style, creative branding, unique dining and nightlife partnerships. W Dubai Al Habtoor City, is where style visionaries and cultural connoisseurs converge to redefine what’s new on the global stage. 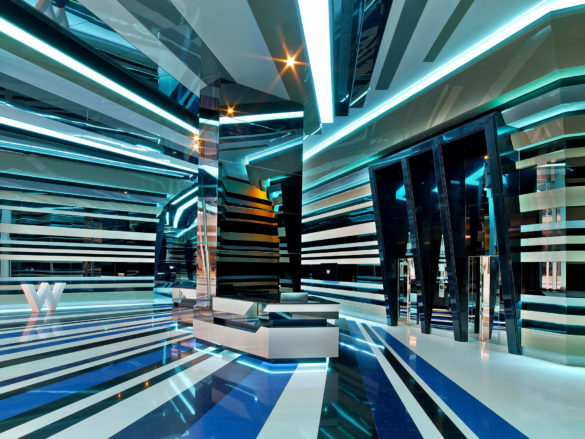 With their signature “Whatever/Whenever®” service and W Insider with the scoop and access on the city’s top spots and hidden gems, W Dubai is the pulse of next generation fashion, music, and design. 2. 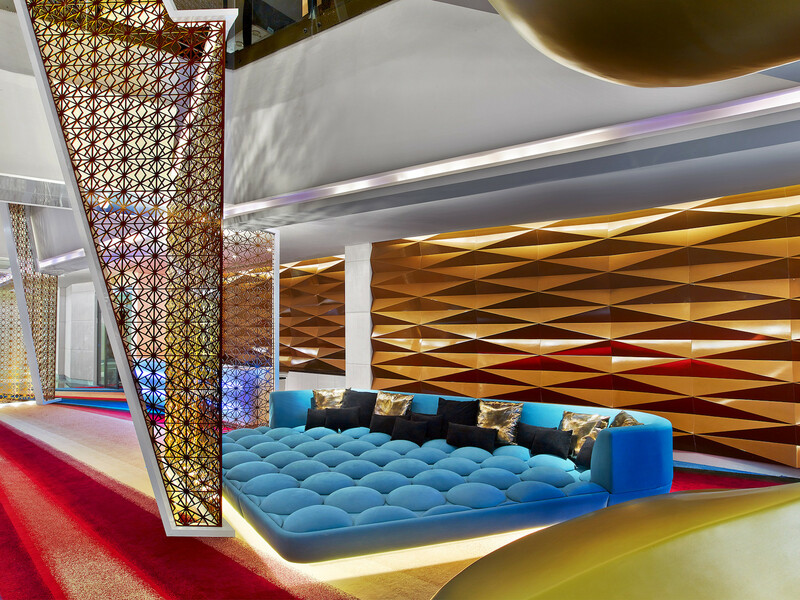 Affordability – The cost of each room starts at AED899+/night. This includes early check-in from 12 noon and late check-out until 5pm, complimentary welcome beverage upon arrival, breakfast and WiFi access. 3. Your phone = room key – 21st-century technologies are finally kicking in! Forgot your key card? Not an issue! W Dubai, being a part of the Starwood group, the hotel’s offers its SPG Keyless entry technology, enabling guests to use their smartphone or wearable technology as a room key to access rooms with a simple swipe of their device. Of course, you need the SPG app for that. 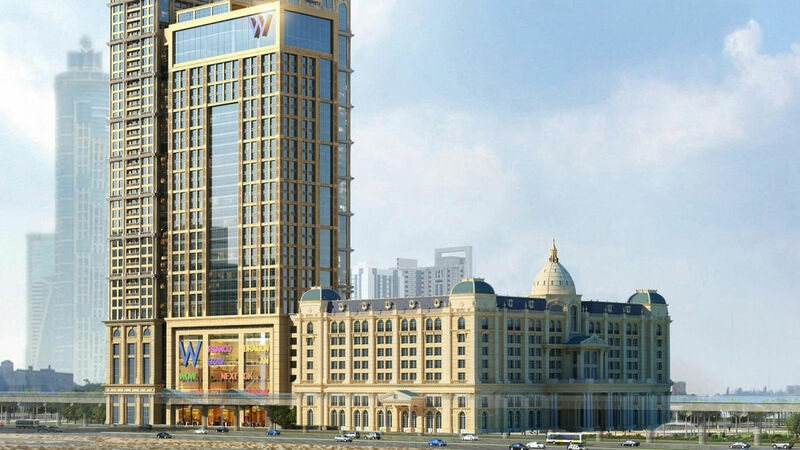 W Dubai is conveniently located at the heart of Dubai! It is approximately 15km (20 minutes) from the Dubai Airport, 6.5km (15 minutes) from The Kite Beach and 5km (10 minutes) from the very popular The Dubai Mall and Downtown Dubai. With more than 1,000 sqm of event space and meeting rooms, W Dubai – Al Habtoor City orchestrates fully adaptable conference equipment and world-class audio-visual facilities to set the stage for lively and spectacular presentations. Click here to view the capacity chart and floor plans before you make a booking. Guests can even take a refreshing dip in the pool or bask under the sun at the WET® deck, beautifully landscaped and adorned with cabanas and deckchair-friendly amenities. They can even recharge in the state-of-the-art FIT gym with a workout, plus fun bites, healthy snacks and uplifting drinks. Traditional room names are too traditional for W! 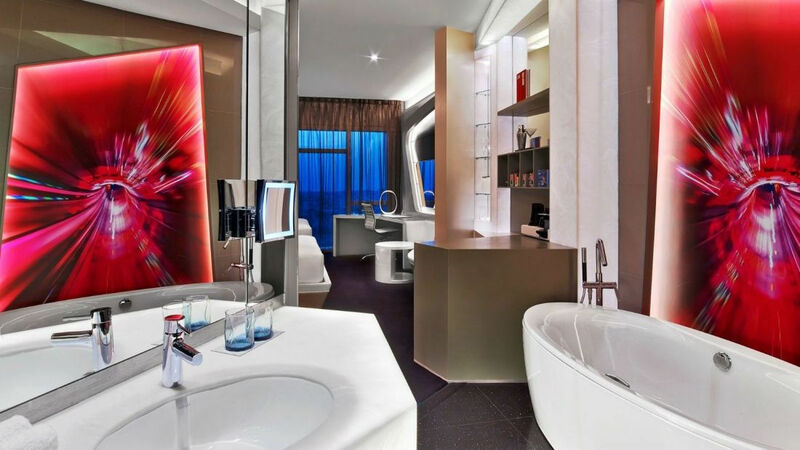 At W Dubai, the rooms are called fantastic, fabulous, marvelous, sensational, spectacular and wow – yes!!! 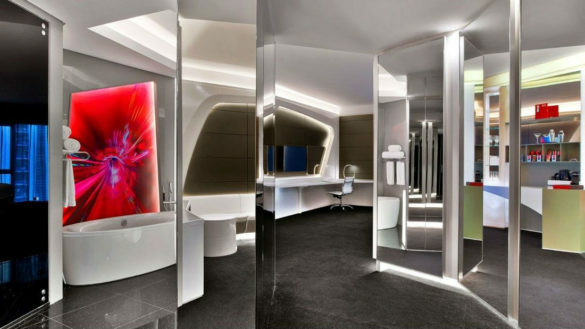 There are 356 rooms in total, all with keyless entry systems and the most stunning/futuristic interiors. 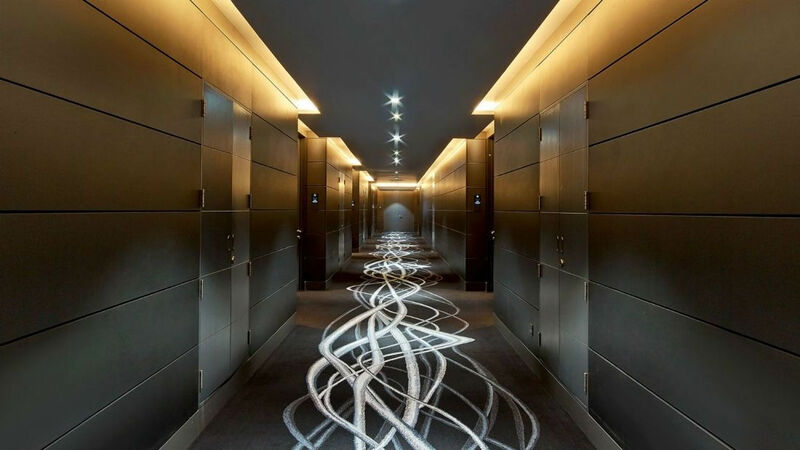 There’s a smooth flow linking the wardrobes, bath, and bedrooms, rather than compartmentalized styles we’re used to, and the décor is all funky shapes and stick lighting. The best room in this property is *hands down* the 2 storey “E-Wow Suite” priced at approximately AED40,000 per night!! It’s got the most phenomenal view, a champagne tub and so much more. Click here to read more about it. What I loved the most? Floor-to-ceiling windows and the ‘all open-plan areas’ that extend from the bathroom to bedroom. Take a dip, sip a drink, and mix and mingle at WET® Deck – W’s poolside party/living room. 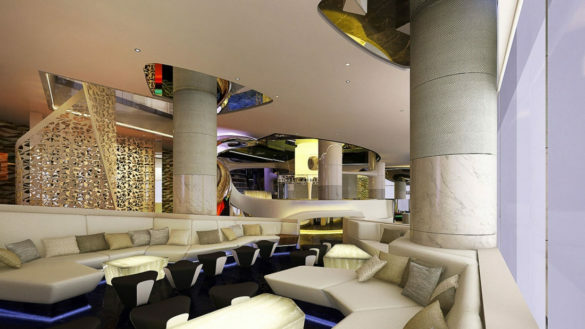 Live it up by winding down at the city’s most sociable setting, home to cabanas, a DJ booth, and dynamic W Happenings. They serve international cuisine and the dress code is casual. A Mediterranean-inspired venue with theatrical open kitchens and chef tables. It’s inspired by a daily market and features seasonal produce, but rather scarily, is being described as a casual, yet social hotspot. Scintillate your palate by traversing a comprehensive Mediterranean terroir at Level Seven, where regional classics mingle with their modern renditions, the entire experience is thoughtfully paired with handpicked wines. It’s opened 24 hours, 7 days a week and has a ‘smart casual’ dress code (smoking is prohibited).